Highlights of the Sky Bet League One match between Bradford City and Fleetwood Town. Steven Davies struck a late winner after coming off the bench as Bradford secured a come-from-behind 2-1 win against relegation threatened Fleetwood. All three goals came in the second half, as Town led through Jamille Matt, but City fought back when top scorer James Hanson headed home, before Davies got the clincher in the dying minutes of the game. Amid a combination of wind and sleet, there was barely a sprinkling of chances in the first half. Antoni Sarcevic's low 25-yard effort on 17 minutes for Town went wide, while Bradford's Billy Knott saw a rising shot from range well tipped over by goalkeeper Chris Maxwell. 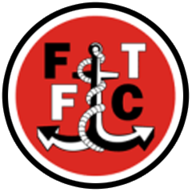 Bradford sent new signing Wes Thomas on at half-time - in place of Christopher Routis - but Fleetwood shocked their hosts just before the hour as Matt rose above a crowd to head home Jimmy Ryan's long ball. The lead lasted just eight minutes as Bradford's dangerous crosses helped level things, Hanson heading home after help from Knott. 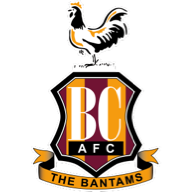 Bradford's first chance for a late winner came as Tony McMahon's free-kick was spilled by Maxwell, with Knott ballooning over from point-blank range. However, they succeeded deep into injury time as substitute Steven Davies tapped in after an initial shot by Thomas was saved onto the bar.